Right now, I&#39;m primarily using Hirst blocks to make terrain for my friend&#39;s tabletop RPG. He uses Lego minifigures to represent players and other humans, and plays on a hex map that is fairly deeply integrated into the game&#39;s combat system. As a result, a lot of the things I&#39;d like to do--hills and other extensive pieces of terrain to stand on--are not possible. What remains are obstacles, things to block LOS, and anything else that creates tactical possibilities in battle. His latest thing: houses. My first one was a simple box and had no interior; one did not seem necessary since it wouldn&#39;t get used. 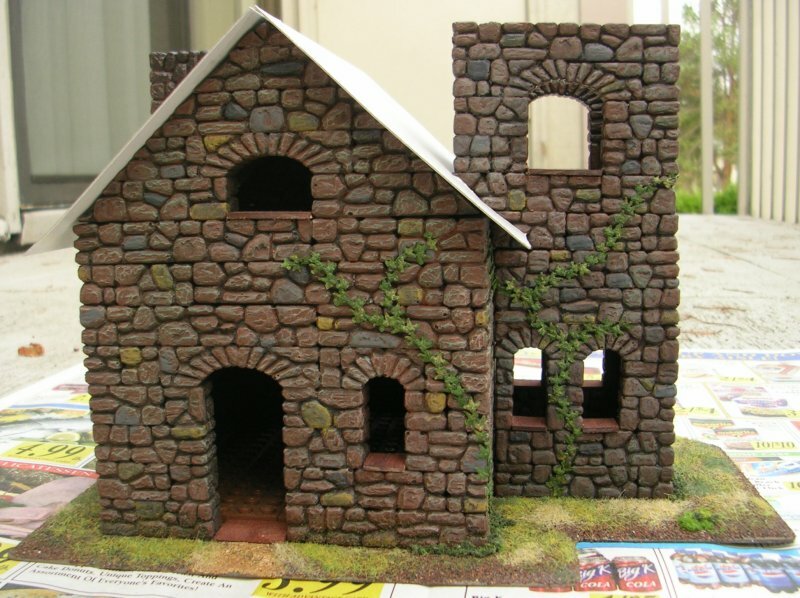 Having the FS wall mold, though, I thought I&#39;d give the Warlock House a try, and it seemed a shame to waste all that internal space. This is not quite finished yet, so the roof is temporary (just a piece of card) and I haven&#39;t quite figured out what to do with the top of the tower. Here are front, back, side and 3/4 shots. 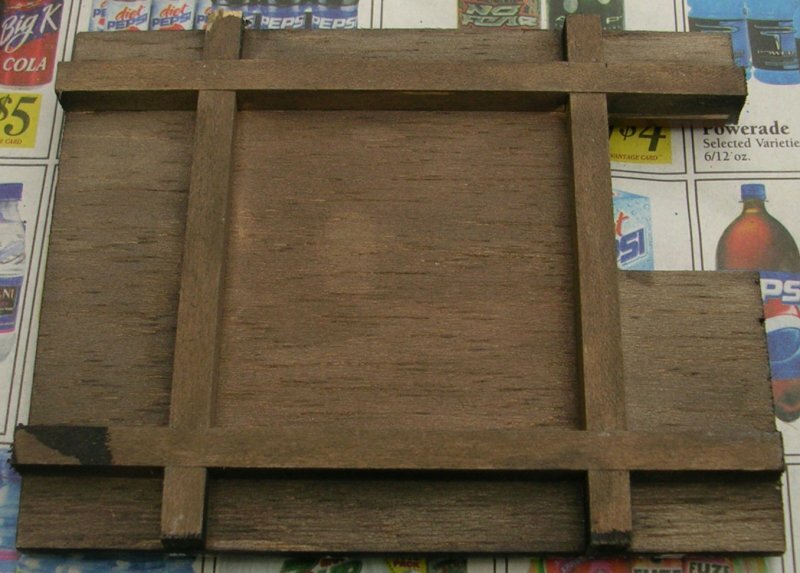 The fieldstone was first spray primed black, then based in a generous coat of Burnt Umber craft paint, which is almost identical to Vallejo Game Color Scorched Brown. The second coat, kept out of the crevices as much as possible, was a 1:1 mix of the BU and a semi-opaque Burnt Sienna. Next came a still-lighter coat, really a wet-brushing, of plain Burnt Sienna. Finally, a drybrushing of Antique White. At this point I washed the FS heavily with a watered down 1:1 mix of BU and black. I then drybrushed it again, very lightly, with VGC Foul Green, for a damp, mossy/moldy look. I then picked out individual bricks with very light wetbrushings of several colors: Payne&#39;s Gray (very dark with bluish hints), Dolphin Gray, VGC Cold Gray, and VGC Plague Brown. 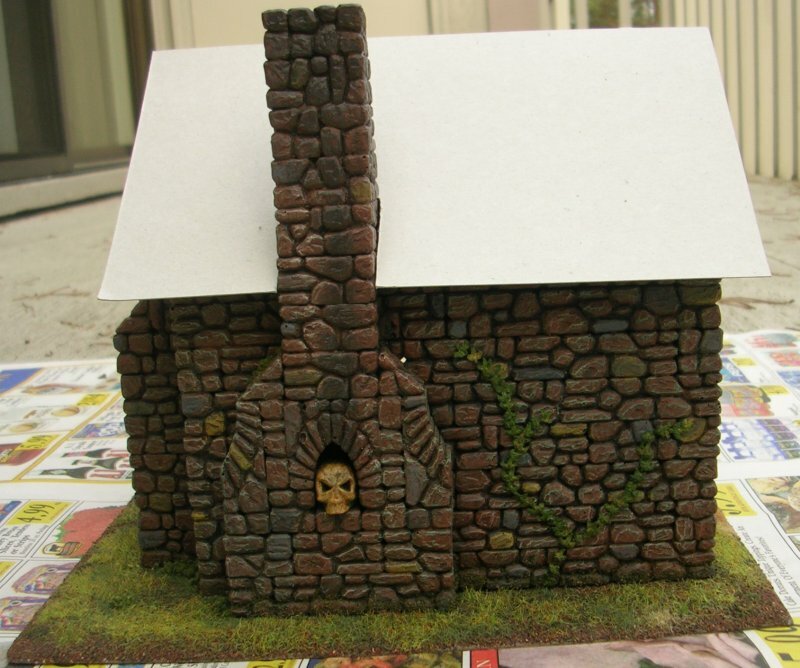 I then gave it one more light wash with watered down black, and drybrushed black heavily on the chimney. The skull on the chimney was left alone in the previous process after the Burnt Sienna went on. It received VGC Cobra Leather, highlighted with VGC Bone White and washed with Flesh Wash ink. The vines and ivy are Dungeon Creepers and Ivy Leaves from Antenociti&#39;s Workshop. Unlike the pillars before, the leaves were placed individually with tweezers, so I think they came out looking much more natural, particularly after I did some studying as to how ivy grows. The lintels on the windows are balsa stained with pure Flesh Wash.
With the roof and second story tower off, you can see my solution to the Lego figure angle. 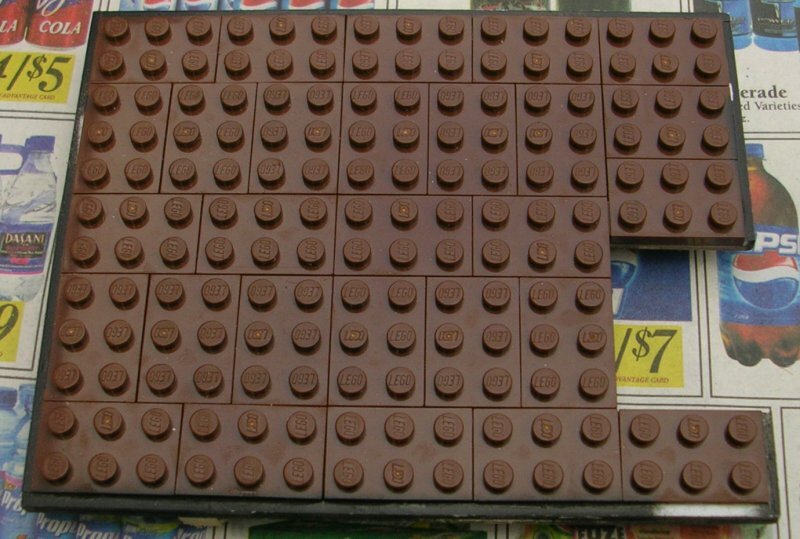 I went to the Lego store, and lucked out--they rotate the loose bricks they sell constantly, and that day they had a bin full of brown 2x3 plates. A single Lego stud is 5/16" square, which meant that I needed a 12x15 plate to be the second floor of the house. I used 28 2x3 plates to do this, leaving a 3x4 gap on one side just large enough for a minifig to climb up through. 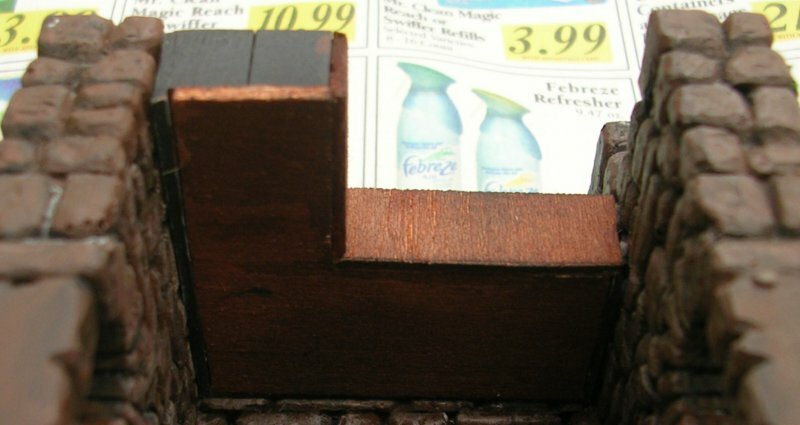 I used large bricks to secure the entire floor in place, and then mounted it to a plank of 5x4x1/16" balsa using CA glue. The lego plate (being 4 11/16x3 3/4") obviously left gaps between it and the edge of the balsa, so those were filled with strips of styrene and painted black. Balsa is not the sturdiest of materials, and I was certain the floor would not withstand the pressure of having minifigs and possibly other furnishings pushed down on it. So I took some 1/4" basswood and made support timbers out of it. I was fretting about how to do a proper lap joint but in the end I used a razor saw to cut halfway down on either side of where the joint should be, and then pinched the soft wood out with needle pliers. This worked better than I expected and was very quick. A little bit of filing and a drop of CA glue produced a strong, snug joint. Unfortunately I got a little careless with a smear of black paint on a fingertip, which resulted in the black mark you see below. Players will rarely see this side of the floor, though, so I don&#39;t much care. Lesson learned. I bought only as many brown plates as I needed, which was a mistake--I realized I wouldn&#39;t have enough for both the top of the tower and the second story. 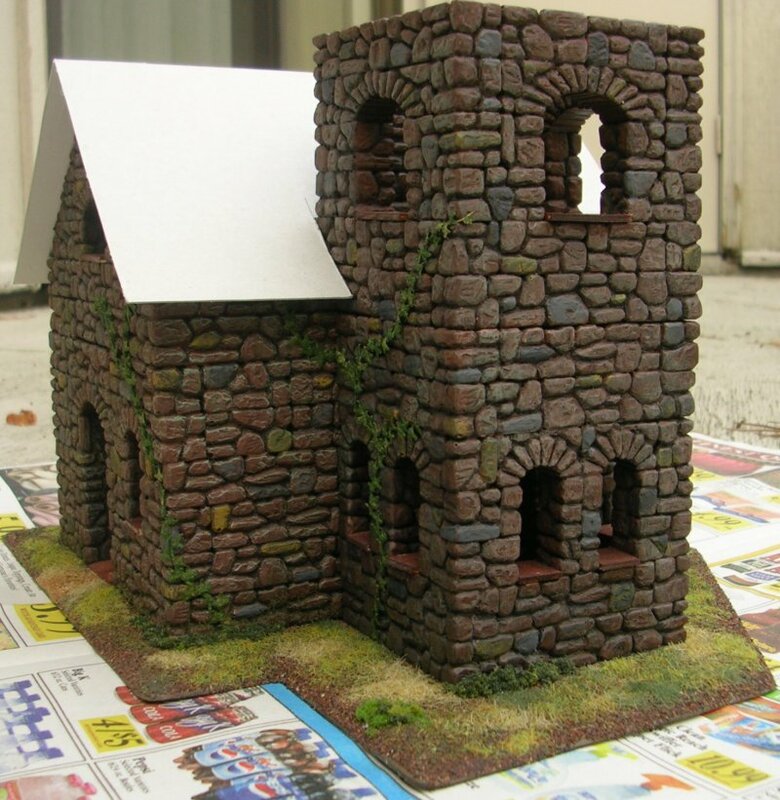 Long story short, I was lucky enough to have a bunch of 1x2 bricks of the same brown color, so I turned some of them into the second story of the tower, built up basswood and styrene around the gaps, and the problem was solved. 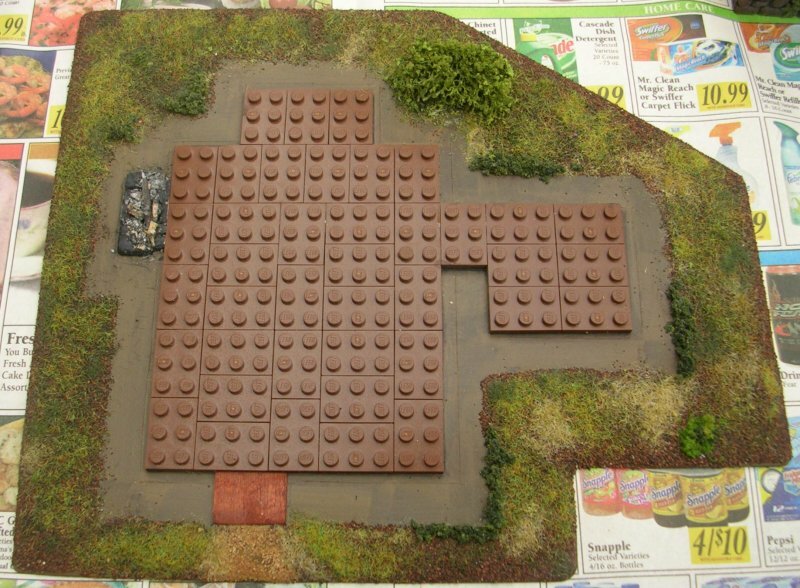 Here you can see the "baseplate" for the house. The entire inside of the house is playable, and again I did the lego plates by securing them with larger bricks on top before gluing them down to the base, which is 3mm MDF. I have a number of flat pieces of fieldstone left over from when small amounts of plaster spilled into a brick that was left empty. I used some of them to make the bottom of the fireplace, which was spraypainted black and drybrushed with a very dark gray. I then took the smalls scraps of balsa and basswood I had from the rest of the project, and burned them up. They were fixed in the fireplace using scenic cement and CA glue. The basing was done using my current soil mix, covered with turf and static grass from Woodland Scenics and the other usual sources. As to the top of the tower--I didn&#39;t like the original design, so I was going to scratchbuild something for the top of the tower, into which I&#39;ll place one more level of Lego plates. Problem is, I have yet to like the looks of anything I&#39;ve sketched up. I&#39;m still working through this. Excellent Job, the whole piece is great you did an awsome job on the color and the base is super too, good use of grass and again the color looks very realistic. I look forward to seeing it with the roof done. again, very well done! Yes, the colour of the stones is very realistic as terrainwoman says. 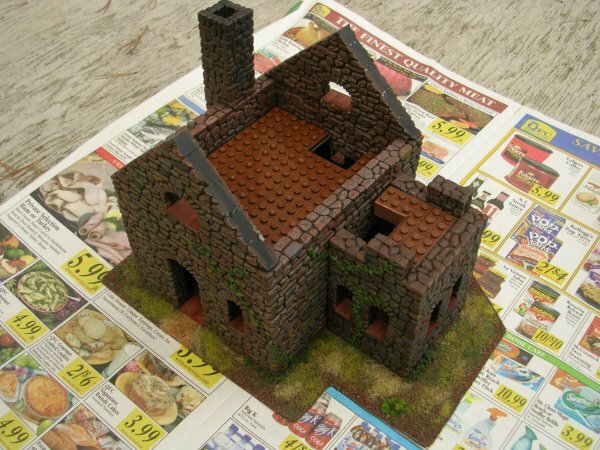 how r u gonna do the roof... tiles, stone tiles, wood, thatched... ?? I would put either battlements on top of the towe, or put a pyramid shaped roof on it. Nothing else will go. That is a very nice building. I don&#39;t like the skull though, it looks out of place to me. How are you going to do the roof? Your building looks awesome! 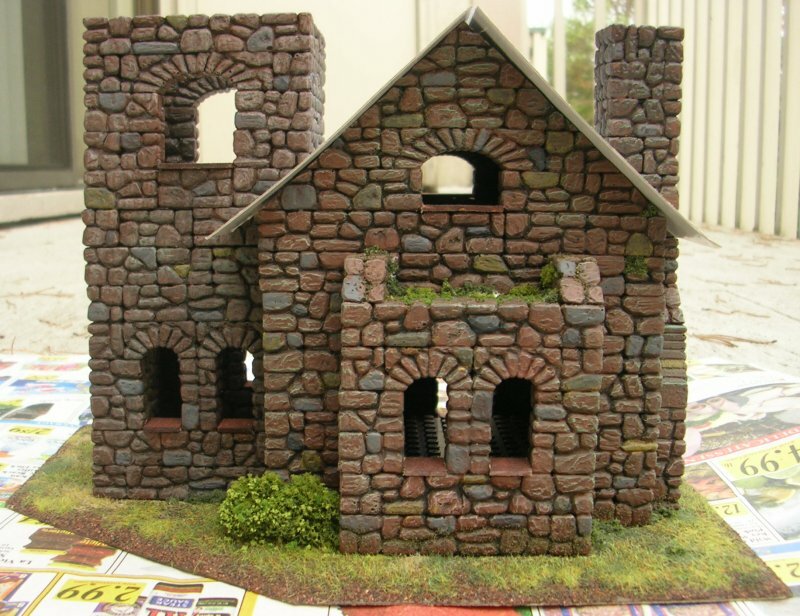 The stonework is incredible, it looks very realistic. It even has the Lego touch. Simply outstanding. Can you tell me a little about the workings of the RPG?